If you hope to attend a service academy, good for you! If you are selected, you will receive a free, top-notch education, some of the best leadership training in the world and an officer job waiting for you after you graduate. If this is your goal, the time to prepare is NOW. The preliminary application for a United States service academy should be submitted in your junior year. The process of preparing, however, should start from your first day in high school. This way, you can begin building the application necessary to gain selection. The academic requirements at service academies are among the highest in the nation. Of all the factors that can help you gain acceptance, grades are the most important. Service academies are looking for students who not only achieve excellent grades but take the most demanding courses. It is critical that you take a variety of Advanced Placement courses, higher level mathematics and sciences and possibly some dual credit college courses. Most of the students accepted by service academies graduate in the top 20 percent of their class. Candidates are evaluated on the total-person concept. To improve your chances, get involved in a variety of extra-curricular activities and show your leadership potential. Since service academies have a high physical fitness requirement, a varsity sport would be an excellent option. Also, participate in a club or organization that engages in community service. Finally, whichever sport, club and/or organization you join, step up to the plate and take on a leadership role, such as a captain or officer. Try also to become a class officer in your high school. Service academies will definitely notice your leadership positions. Each service academy has a liaison for a geographic area. Find out who that person is and contact him or her. Do not wait until your junior or senior year to contact that person. Do it so as soon as you consider attending a service academy. At some point, you will be scheduled for an interview with the liaison, and you should prepare yourself by being able to discuss current events, both national and world. Practice prior to your actual interview so you are comfortable and confident. such as a camp counselor. Not only will these opportunities pad your resume, it will show the service academy that you are serious. Be sure to apply for the service academy summer seminar, which is the summer after you complete your junior year. Once you have completed the summer seminar program, you will be automatically processed as an applicant for the academy. Check the website of the service academies you wish to attend beginning in November and apply at the earliest possible date. If you are not accepted, visit the academy or academies you are considering. Make sure you schedule an official registered tour so there is a record of your visit. Nominations can be made by a senator, congressman or the vice president. Begin as early as possible to contact these individuals and introduce yourself. Try to actually meet them at an event if possible. Make sure you make a good impression by the way you dress and conduct yourself. Once you have made the initial contact, be sure to stay in contact regularly to keep your name familiar to that nominator. Update that person on how you are doing in school and important events that can impact on your application. Recommendation letters can have a big effect on your service academy selection, so give careful thought who you request one from. Recommendations should include teachers, guidance counselors and any military officers that you may know. Ask for the letter early on. Give the person or persons at least three-week’s notice so you do not receive a rushed letter. Each service academy applicant must pass a medical examination to ensure he or she can handle the physical fitness requirements. The requirements at the academy can be daunting, so work out regularly to make sure you can easily pass the fitness component. 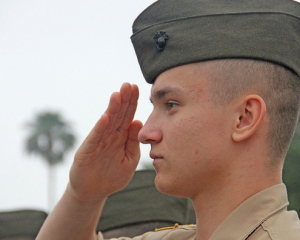 There may be other things you can do to better position yourself for service academy selection. Once you have contacted your academy liaison, he or she can help you in detailing additional things to better your odds. Also, some military schools, such as Marine Military Academy, can make direct nominations to the service academies. If you want to attend a service academy and are ready to start your military and leadership training in high school, then you should consider this option. The key is to start the process as early as possible so you can map out your strategy while you are in high school.